I am a borderline Baby Boomer that has been in the administrative workforce for more than 20 years. I have an Associates Degree and have attended numerous software training classes and seminars over the years. My experience ranges from Sales Department Assistant to Executive Assistant to the CIO, from small companies to global corporations. When I began my career, the mindset was that you worked for one company for many years and then they give you a nice retirement package. Unfortunately, those good old days are gone. Corporate America has changed so much over the last 10 years, and people are beginning to realize that they are their own security. We moved to a rural community just outside of Ft. Worth, Texas 3 years ago. I was commuting to a job, 25 miles each way. After 2 years of commuting, I was lucky enough to find a job in my town, only 9 miles away! When the economy started freefalling in the fall of 2008, the company was forced to downsize and I was laid off. I was devastated and angry. I never want to feel like that again. The thought of job searching and commuting again was heart wrenching, but it made me determined to do something else. I don’t know where I heard the term Virtual Assistant, but as I was job searching online, I Googled it. I read several websites about the freedom that being a Virtual Assistant offered. And, being in a rural community, this would be perfect for me. I had an extensive administrative background and a home office set up. There was one website I kept going back to VAnetworking.com. There were real people sharing real stories of their business and how they got there. They were friendly, joked with each other, and were not afraid to give information about their business. It fascinated me; women in the corporate world sure weren’t like that! I was hooked on the Forum and signed up as a free member. I began to think I could do this too. After all, I’ve always given 110% to my employer, why not myself? After about a month of reading and researching, I ordered the VAC and haven’t looked back since! What a thrill to control your own destiny! Every question I have had along the way has either been answered in the VAC modules or on the Forum. 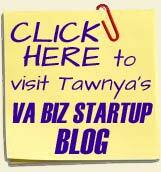 It is a goldmine of tools and information, and I highly recommend it if you are serious about becoming a VA. Tawnya truly gives you everything you need to get started…..and then some. For me, the templates have been priceless. It would have taken me hours to create them from scratch. But that is just a small piece of what she’s put together. She sincerely wants everyone to succeed and you feel it from her! She has answered all of my e-mails, and even helped me with my website. It is amazing to me how she supports the Virtual Assistant Industry, VAnetworking.com and its members, runs her own business, and has a family. I believe she is an inspiration to this industry and I’m proud to be a member of her founded association, VAnetworking.com. I would like to Thank Tawnya, for putting together such a wonderful VAC for anyone wanting to start their own “Virtual Assistant” business or to grow theirs. I had been out of the working world for a while staying home with my son and decided that it was about time that I get back since he would be attending college in a few years and all of the job positions that I had found was with companies that were clear across town and I had “been there and done that” more than I wanted and wasn’t wanting that dreadful commute anymore. I decided to do some researching online and that is where I found the VAnetworking.com forum for “virtual assistants”. As I read all of the information which was quite overwhelming and prayed about it, it became clear to me that I was already a “virtual assistant” but just didn’t know it. I had a client and had been working this way for right at a year. I fully read about her VAC system and was not sure at first if it was worth the money! But talked with my husband and he told me that if it was what I really wanted to do “then go for it”! And with more encouraging words from other VAs on the forum I decided to bite the bullet and purchase the VAC system after all. And that is what I have done. I purchased her VAC system in April of 2006 and opened my business two months later and haven’t looked back since. Her day to day processes that leads you from asking you questions to make sure you are ready to open your business all the way thru to marketing, operations, financing, and etc. And who could do without those templates! I had been an administrative assistant for 20+ years or Office Manager in the Real Estate Property Management area and decided to make Real Estate as my “niche” as she taught us as being one of the first of your decisions you have to make. I have several clients and am still growing my business and she along with her other wonderful VAs with their support and inspirational words and guidance have helped me to make what my business is today! I highly recommend the VAC to anyone who is thinking about opening a virtual assistant business or to those seasoned VAs who just want to give their business even more incredible resource. Tawnya, I want to thank you again for putting so much of your energy into this system and your love for helping others. 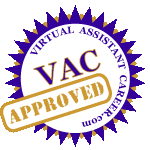 The VAC is a wonderful tool for anyone who is interested in starting their own VA business. I have gained insight into so many areas of starting my business from how to choose a name to marketing strategies to website design. The templates are also a tremendous help. I would highly recommend the VAC to anyone who is contemplating starting their own VA business. It is well worth the cost! I’d been trying to start a Virtual Assistant Business for some time. While doing some research online this particular day, I came across Tawyna Sutherland’s Virtual Assistant Career training program. This product has everything a potential Virtual Assistant will need to begin their VA business. There’s a plethora of templates, resources and priceless information provided for a VA to become highly successful and profitable!!! Included with this exceptional system are templates which are a shear ease to use, they’re simple and concise. The VAC comes with a mentoring coach, there’s a variety of professional discounts and memberships. 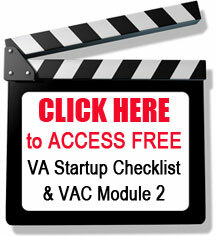 The VAC modules are an essential necessity; this is the VA’s bible! This 30 day modules walk you and guide you through the incubation period all the way to the beginning process (opening day). I am forever appreciative and grateful to Tawnya for her evident dedication and perseverance which she’s demonstrated and provided in the VAC. I am now my own boss!!! Recession, what recession? I love my VAC! Although I have an extensive background in being self-employed I am finding the system easy to follow, well organized and a good lesson in goal setting. I’m looking forward to my new “career” and am certainly appreciative of all the help that I have received and the prompt responses to my questions. I’m sure I’ll have many more as I progress down this new path. VAnetworking.com has been extremely beneficial as well. I received my VAC in November and it was the best business decision I’ve made outside of the decision to become a VA. This online training center was a godsend for me. Before using the resources in the VAC, I was spinning my wheels trying to think of and do all the necessary tasks to start a business. I immediately set out to complete all the steps and utilize the templates and other resources that I needed for my business. Since the templates were already written, all I needed to do was fill in my business information and make minor changes in wording to suit my needs. Did I mention, I had my business set up and running in a fraction of the time it would have taken without the VAC since I didn’t have to research and write from scratch? Instead of just spinning my wheels, the VAC provided the traction I needed to get to my destination…a fully functional VA business six months sooner than my original plan. Now that I’ve gone through the system, I still refer back and use additional resources and templates in the online training center which I have access to for a lifetime. My VAC is now my Personal VA. Don’t laugh, I call her Vanessa. I have scribbled notes and directives on just about every page I’ve printed out and have used up two or three highlighters to highlight the most important information for my needs. Thank you Tawnya for such a valuable resource for Virtual Assistants. VAC IS the way to go! The beginning of 2008 I was laid off from my bookkeeping job at a local charter aviation company. I had always had in the back of my mind that I wanted to work from home in order to be there more for my growing children (ages 16 and 15 at that time) and to have more time to spend with my hubby who works a rotating shift. I also knew I wanted to be a virtual assistant being that one of my friends had started a virtual assistant in 2006 and was doing quite well at it, not to mention I already had the skills. Prior to the bookkeeping job, I worked 8 years in the title and escrow field as a closing agent, 1 year in the mortgage industry and several years as an administrative assistant. What I didn’t know, was how to start a virtual assistant business. I knew I need a website, but I didn’t know how to go about getting my name out there or how to get clients. After doing hours of research on the Internet I knew purchasing the Virtual Assistant Career was the way to go. There were other systems out there, but none stood out like VAC. The reason VAC stood out to me was because of the awesome testimonials, like this one, from real life people who learned all they needed to know about starting a VA business after purchasing their kit. I don’t like hype, and every time I came across one of Tawnya Sutherland’s sites, they were clean, neat and hype-free. The first set of questions in it really get you thinking about the road you’re about to embark upon as a virtual assistant. And it even helps you determine if starting a VA business is right for you. The great thing about the system is that it comes with a money-back guarantee. Because I was unemployed when I got it, I was able to go through the modules in less than the 30 days. I was doing two days worth of reading and action steps at a time, if not more. That’s another great thing about the system; it’s easy to read, comprehend and retain. The “homework” is actually doing the steps necessary to get your business “doors” open: naming your business and determining if you want a DBA, a sole proprietorship, a partnership or to be incorporated, writing out a business plan (a form comes with the system and you pretty much fill in the blanks), getting a business loan if needed, keeping track of your income and expenses and so much more. Not only does it walk you through each of these steps, the system also comes with template for every business form you could possibly need. Now that I’ve been in business for just under one year, I’ve not only began making the kind of money our family needs, I’ve built my business up so much that I am considering hiring a helper to help with the things I don’t really like to do, but need to be done J. If you are even remotely thinking about starting up your own online business, VAC is the way to go. The system will teach you everything you need to know about being a virtual assistant and then some!